Early on a Saturday morning in May 2018, I once again found myself on a plane headed for Houston. As in the past, this was a work trip, but I had planned to go down a day early in order to get in some barbecue before my 4 days of customer meetings. When I booked the trip, the early morning flight that got me into Houston just before lunch seemed like a great idea, but arriving at the airport at 4:00 am after a near sleepless night didn't feel like my best plan ever! I managed to get a little shut eye on the plane and arrived in sunny, hot & humid Houston around 11:00 am. 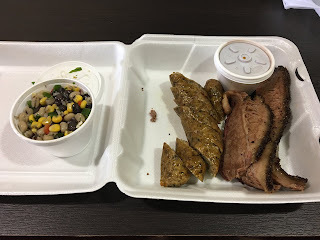 I recovered my luggage, picked up my rental car and headed straight to my first barbecue stop, Tejas Chocolate and Barbecue in nearby Tomball. It was about a 30 minute drive from the airport and when I arrived there was a lineup about 10 or 12 deep out the front door. Tejas was ranked number 6 in the Texas Monthly Top 50 last year. Last summer after the issue came out, I was able to get a copy delivered to me in Calgary which included the Top 50 Passport. I'd been hanging on the the passport for close to a year waiting to get some stamps in it and this was going to be my first one! The line moved at a decent pace and once I'd made it onto the patio I grabbed one of the Lone Star beers they keep in a cooler outside for their customers. I was in Texas after all and Lone Star is the National Beer of Texas! The restaurant is located in an old house in Tomball with a large front patio. Once inside the doors, I was able to take stock of the decor. They have Stewart's Soda on tap and the line takes customers past perhaps the most unique feature I've seen in any barbecue restaurant...the chocolate counter. Tejas started out as a bean to bar chocolate craftory and when they realized that chocolate alone wasn't going to pay the bills, they decided to add barbecue to the mix. I for one am glad they did! It had been requested that I bring some chocolate home, so I scoped out the display while waiting to order my lunch. I was posting to Instagram while in line and I received a reply from them inviting me to come back to the pits after I'd eaten to say hello. Very cool! When it was my turn I ordered some brisket (moist, of course) and a jalapeno cheddar sausage with a side order of their famous carrot souffle and a shot of the mole barbecue sauce. You order and pay at the counter here and they give you a number. I found a table on the covered patio outside and it was only a couple of minutes before my number was called. I went inside to get my tray and grabbed some pickles before heading back to my table. A tray of pure barbecue gold! That first bite of brisket was pure heaven! I'd been away from Texas for too long and I was so glad to be back. The Tejas brisket easily ranks up there with the best I've had...Franklin, Louie Mueller..anywhere. The fat on the moist brisket was perfectly rendered and the pieces of meat easily pulled apart and melted in my mouth. The sausage was equally good. Cheesy with just the right amount of jalapeno kick and flavour. I had been hearing about the carrot souffle for a while and was eager to give it a taste. The piece of souffle in a small cup appeared cake-like, with a golden orange colour and a deeper orangy-red top. I put a forkful in my mouth and was delighted. It was light and creamy in texture and the flavour was excellent. Perhaps the most unique side I've experienced, and definitely a treat. The mole sauce was a nice addition as well. They used to provide it for free, but it complex and costly sauce to make with a lot of different ingredients and they found that it was being wasted. Now for $1.00 you can get a small cup of it. All around, this was easily one of the finest trays of barbecue I've eaten. Once I finished enjoying every last bite, I made my way back to the pits and was greeted by co-owner and pitmaster Scott Moore. We chatted for a few minutes and Scott showed me their large Moberg offset smoker, Dude. I recalled seeing pictures of it being craned into place on social media when they took delivery of it shortly after the Texas Monthly Top 50 rankings came out last year. In an ode to The Big Lebowski, the nameplate on the firebox reads "Dude Abides". After visiting with Scott I went inside to pick out some chocolates to bring home and added another t-shirt to my growing BBQ joint collection. From there I headed into Houston and made my way to Roegels. I'd had the opportunity to enjoy Roegels on my last Houston trip and it was excellent. They are also another Top 50 joint, so that meant another stamp in my passport and it was an chance to get a couple of entries into the Tales From The Pits podcast big giveaway. Brian & Andrew from the podcast have placed one of their stickers at 10 bbq joints around the state. To get an entry into the contest, you need to take a selfie with yourself and the sticker in the picture, and you get a second entry if you also include a picture of your food from that restaurant. The prize is a Yeti cooler stuffed full with t-shirts, hats, coozies, stickers and some gift cards and other swag. I managed to get 6 out of a maximum 20 entries while I was in Texas. The draw is at the beginning of July...fingers crossed! 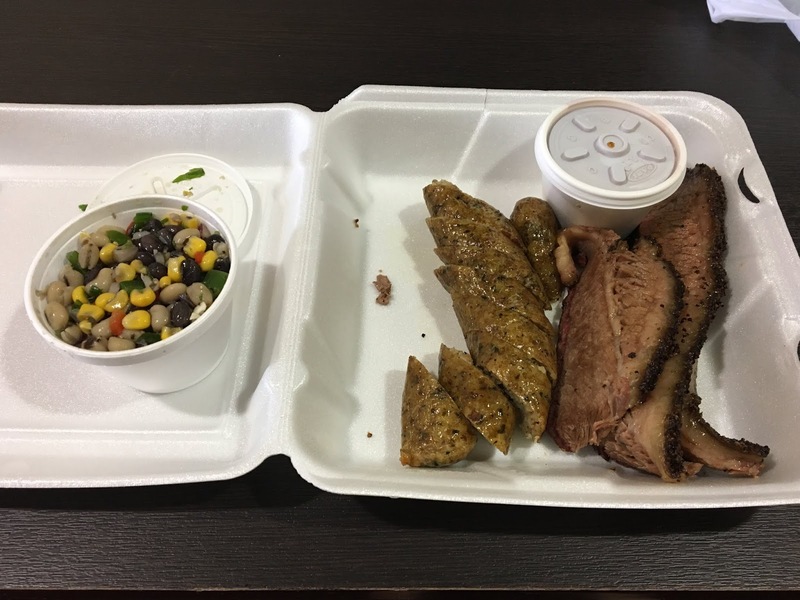 I ordered some brisket, a boudin sausage and some Texas caviar to go. When I was at Roegels last year, I ate lunch at the restaurant and got an order of their Bourbon Banana Pudding to go. By the time I got around to eating it at the airport, it had warmed up and was a little runny. This time around, I ordered my food to go and ate the banana pudding fresh and cold while I was there. I was once again served by Bruce, one of the friendliest and most helpful barbecue people I've come across. Once I got checked into my hotel I stashed my to go box in the fridge and when I ate it cold two days later it was still excellent! Clearly a quality product. After my day of travel and eating, I was done for the day. I packed it in for the night, ready for another day of barbecue starting the next morning!